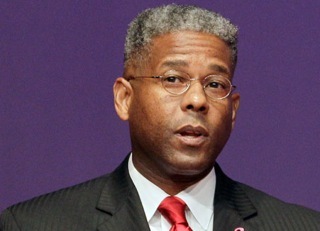 You may have heard about the tiff between Representative Allen West (R-Florida) and Representative Debbie Wasserman-Schultz. (D-Florida) If not you can read about it here. In short , DWS criticized West's support for Medicare cuts, given the high number of seniors living in his district and West went ballistic, firing off this email. Now this is pretty pathetic because it shows among other things that West is incapable of taking criticism without reacting personally. It was pretty over the top behavior for someone who is supposed to be a cool calm leader. But ok. Congress has seen worse. But West wasn't done of course. He went on the Mark Levin radio show where he saw fit to drop these words of wisdom. The thing that really most aggravates me is that there's this double standard in that the people on the hard left can continue to attack conservatives -- and especially minority conservatives and female conservatives. But yet when all of a sudden you stand up and say you will not tolerate this any more, then they claim to be a victim, which I find to be absolutely laughable...People who are black conservatives — I grew up in the inner city, strong values, came from a strong military family and background — (and) what we do is we totally invalidate the liberal social welfare policies and programs...“I’m a threat because I’m the guy that got off of their 21st Century plantation. And they cannot afford to have a strong voice such as mine out there reverberating and resonating across this country. And even more so, they’re not used to anyone that says ‘I’m going to fight back against you.’ That is absolutely reprehensible to them. Whoa....wait a minute there Nat Turner. Aren't the defining characteristics of Black conservatives supposed to be personal responsibility and a belief that racism either no longer exists or is so small as to be not worth bothering about? I mean that isn't what we hear all day every day from such conservative icons as Shelby Steele, Walter Williams, Ken Hamblin, Ward Connerly, Clarence Thomas, Star Parker, Thomas Sowell and others? Hmm. Ok I guess I get it now. I really do. If you constantly have your work checked and double checked for mistakes you never made..
then obviously you just need to work harder my friend and stop whining. Being Black has NOTHING to do with your issues. Man up!!! Stop being a crybaby!!!! But if you are a Black Conservative and someone disagrees with you, well OBVIOUSLY they're only doing it because you're Black. Those racist so-and-so's!!!! 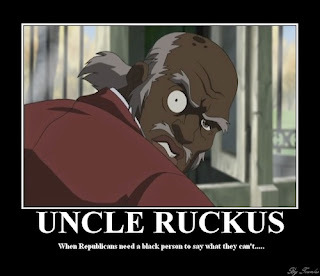 The nerve of them slavemasters!!!! And you should definitely go ahead and use offensive and charged references to lynchings and plantations. Let the chips fall where they may because simply disagreeing with your ideas is JUST LIKE whipping escaped slaves. Oh the humanity!!!! Whether it's Herman Cain claiming Jon Stewart mocked him because he's Black or Clarence Thomas referring to "high tech lynchings" or the ubiquitous black conservative references to "democratic plantations" or comparing some social program or discussion as being just like slavery, black conservatives too often use racially charged language both as a sword to attack their rivals and as a shield to prevent legitimate debate. Most disgustingly the ONLY time Black conservatives ever even appear to consider the possibility that racism still exists is when someone criticizes them or opposes them politically. Victimology powers! Activate!!!!! And I hate to break it to West or Cain or any of the other clowns that traffic in this stuff but guess what? Your family wasn't the only black family to deal with slavery, segregation, discrimination, etc. Millions of other black families throughout the diaspora did as well. So let's stop pretending like you did everything by yourself. Black people in 2011 America are in a better position than we were in 1951 America precisely because many Black (and other) people struggled and died. And that brings me to the final point. Look I myself have some conservative ideas on some issues. There are indeed honorable conservatives of all backgrounds. I think they're wrong on most things but people can agree to disagree. Was West out of line? Is it possible for everyone (black/white/left/right) to tone down and/or remove slavery metaphors and comparisons from modern political debate?